R2014b brought a refreshing new graphics engine and appearance, internally called HG2 (the official marketing name is long and impossible to remember, and certainly not as catchy). I’ve already posted a series of articles about HG2. Today I wish to discuss an undocumented aspect of HG2 that I’ve encountered several times over the past months, and most recently today. The problem is that while in the previous HG1 system (R2014a and earlier) we could add property-change listener callbacks to practically any graphics object, this is no longer true for HG2. Many graphics properties, that are calculated on-the-fly based on other property values, cannot be listened-to, and so we cannot attach callbacks that trigger when their values change. Unfortunately, this fails in HG2 when trying to listen to automatically-recalculated (non-Observable) properties such as the Position or axes Tick properties. We can only listen to non-calculated (Observable) properties such as Tag or YLim. Readers might think that this answers the need, since the ticks change when the axes limits change. This is true, but does not cover all cases. For example, when we resize/maximize the figure, Matlab may decide to modify the displayed ticks, although the axes limits remain unchanged. Similar hidden events exist for all HG2 graphics objects. The MarkedDirty and MarkedClean events are available for practically all graphic objects. We can listen to them (luckily, their ListenAccess meta-property is defined as ‘public’) to get a notification whenever the corresponding object (axes, or any other graphics component such as a plot-line or axes ruler etc.) is being redrawn. We can then refresh our own properties. It makes sense to attach such callbacks to MarkedClean rather than MarkedDirty, because the property values are naturally stabled and reliable only after MarkedClean. In some specific cases, we might wish to listen to one of the other events, which luckily have meaningful names. In some cases, the triggered event might pass some useful information in the eventData object that is passed to the callback function as the second input parameter. This data may be different for different events, and is also highly susceptible to changes across Matlab releases, so use with care. I believe that the event names themselves (MarkedClean etc.) are less susceptible to change across Matlab releases, but they might. Unfortunately, it seems that retrieving some property values (such as the axes’s YTick values) may by itself trigger the MarkedClean event for some reason that eludes my understanding (why should merely getting the existing values modify the graphics in any way?). Adding callback re-entrancy checks as above might alleviate the pain of such recursive callback invocations. A related performance aspect is that it could be better to listen to a sub-component’s MarkedClean than to the parent axes’ MarkedClean, which might be triggered more often, for changes that are entirely unrelated to the sub-component that we wish to monitor. For example, if we only monitor YRuler, then it makes no sense to listen to the parent axes’ MarkedClean event that might trigger due to a change in the XRuler. In some cases, it may be better to listen to specific events rather than the all-encompassing MarkedClean. For example, if we are only concerned about changes to the Position property, we should listen to the LocationChanged and/or SizeChanged events (more details). 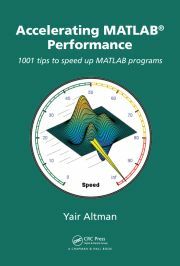 Additional graphics-related performance tips can be found in my Accelerating MATLAB Performance book. Have you used MarkedClean or some other undocumented HG2 event in your code for some nice effect? If so, please share your experience in a comment below. I recall making use of the Hit event on several occasions. IMHO, it is the most useful event in the list. Can’t see why TMW decided to hide it in the latest release. @Yaroslav – thanks. It would be useful to hear how and why you’ve used the Hit event. If one needs only a single callback, I guess that ButtonDownFcn will suffice. If there is a necessity for more than one, Hit is invaluable. Hey thanks, i will use ‘Hit’! @Vlad – that post is 5 years old and used undocumented/unsupported functionality. What’s surprising is not that it finally broke in R2014b, but that it kept working for so long. You can’t expect undocumented/unsupported functionality to keep working forever. Specifically, R2014b broke quite a lot of undocumented features in its change of the graphics system (HG2). In most cases, things that broke have similarly-undocumented (or documented) equivalents in HG2, you just need to dig around a bit to discover them. The hard part was discovering the initial undocumented features in HG1; finding their equivalents in HG2 should be much easier. since MATLAB timers run asynchronously and can execute between any two lines of code, if a timer callback occurs between the check and setting of inCallback, then you can get re-entry if the timer callback either calls reformatTickLabels or flushes the event queue and reformatTickLabels is in the event queue. I think to be safe you would need to do the check and setting of inCallback atomically, possibly with a mex file. @Daniel – I agree that an atomic (mutexed) test-and-set function would be better, although in practice the probability of reentrancy with the above code is low. If you create such a MEX-based function and post it on the Matlab File Exchange , I’ll be happy to reference it in this blog. I’ve been trying to find a way to prevent our users from deleting axes when they are deleting annotations. (This happens way more than I expected, and it is a major source of frustration). I thought it’d be easy to find an event or callback to hook into and pop up a dialog, but it’s proven fairly difficult for me to crack. I thought maybe I could set a listener for ObjectBeingDestroyed, but it fires after the object is gone (or there’s a synch issue). Is there some kind of ObjectAboutToBeDestroyed or DestroyObjectRequest thats double-secret-undocumented? You are my hero – thank you for this invaluable resource. And thank you for pointing me to an (embarrassed) *documented* feature. @Nick – this is a “known” undocumented side-effect of using the high-level plotting functions (such as plot), which reset several axes properties including HitTest and Tag. In contrast, the low-level plotting functions (such as line) do not reset these properties.